Quarterback Johnny Manziel has been "in touch" with the Alliance of American Football league following his release from the CFL, according to Darren Rovell of the Action Network. Update: Johnny Manziel has been in touch with the AAF about possibly playing for the league (his rights are with San Antonio). Told AAF not moving on anything, if they do, until they find out why he was cut loose + to make sure he’s free and clear from Alouettes. 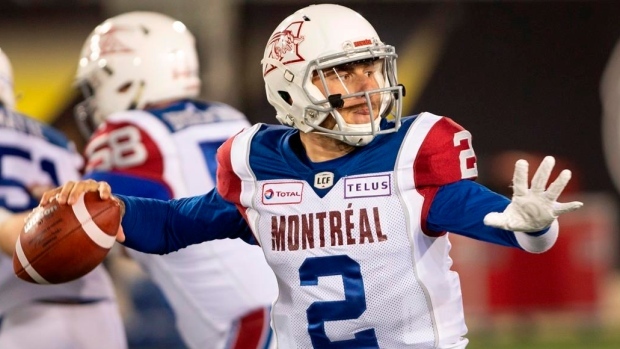 The Alouettes were directed by the CFL to release Manziel on Wednesday after he violated one of the conditions the league set for him when he signed last year. After his release was announced, Manziel wrote on Twitter that he would be exploring his playing options in America. "I want to thank [Alouettes coach Mike Sherman], my teammates, and the CFL fans," Manziel tweeted. "My time there re-established my love for the game of football and the work that goes into it. I look forward to exploring new options within the United States." Rovell notes that the AAF is not moving to sign Manziel until they discover why the CFL directed the Alouettes to release him and ensure he's no longer property of the team. The San Antonio Commanders own Manziel's AAF rights since he played at Texas A&M during his collegiate career. The team has seven games remaining on their schedule, which runs through April 12. Manziel was 2-6 as a starter with Alouettes last season, completing 106-of-165 passes (64.2 per cent) for 1,290 yards with five TDs and seven interceptions. He also ran for 215 yards on 29 carries (7.41-yard average) as Montreal (5-13) finished third in the East Division but missed the CFL playoffs.